Our July meeting was attended by 17 members and we were very happy to add more chairs to the table to accommodate everyone. Our dream is that we fill that room and have to find a larger one to fit us all in. Pat West was our demonstrator in July and talked about Sharon Zeugin, writing on black arches cover with Clorox and then coloring the letters in randomly with colored pencils or with pastels. This was a new technique for many, but reintroduced many of us to the workshop we had 6 years ago at Fernwood. I think I speak for many in saying that when we volunteer to demonstrate a tool or technique, we take out all the supplies from that workshop and remind ourselves of how much we enjoyed the workshop and what we did so that we can share with our members. Thanks Pat for a great demo. August….one of the most fun meetings of the year. On August 3 we got together at my home for our annual picnic. I love opening the door to my calligraphy friends walking in with their dish to pass and to smell the aromas. The food is always incredible and we always want a new recipe from one or more of the dishes. This year it was Renee’s Avocado Salsa Dip, even with all the garlic in it! It was delicious as well as everything else that was brought. We first had our meeting talking about upcoming meetings, and our Barbara Mann workshop coming in October. 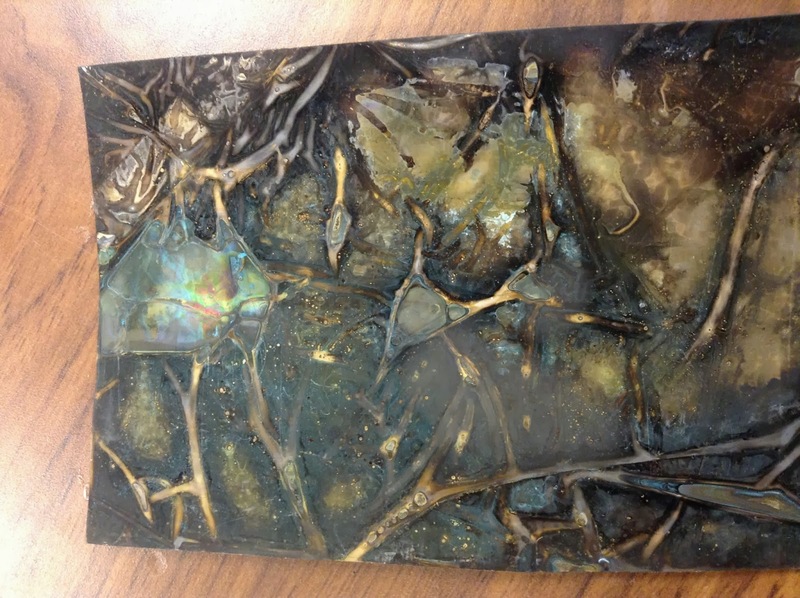 Maureen Trubac did a marvelous demo on how to patina metals. The sun was shining brightly and made some beautiful designs on the metals. Next it was time for our book exchange. The books were lovely and we all appreciated the time it took to make them. We also had a raffle of $50 toward the upcoming workshop in October which was won by Marty Mitchell. Then it was time to eat. My husband was the griller of the day and made us turkey and apple sausage on the grill outside while we took out our dishes to go with it. Everything was yummy as usual. The weather was so pleasant that we were able to sit outside and enjoy the day. Last year it was so hot that we had to be inside. It’s the Midwest…wait a day and it will change. Thanks to everyone who attended and I hope you all had a great time. I know I did! Denis Brown visited at our September meeting…..that is, Denis Brown’s DVD. Thanks to Renee Tuveson and her husband for bringing the DVD and all the equipment to play it during our meeting on a large monitor so we could all enjoy it. 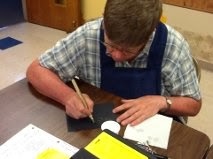 We loved watching Dennis demonstrate the letters of the alphabet in his italic style. Denis is a master of calligraphy and design who has been in South Bend to teach some of us many years ago and we greatly appreciated that opportunity. We also had a bevy of show and tell items. There were several new books, purchased by members in different places, like an old John Stevens book, and books on collage, doodling and zentangles. I guess it is time to go through my old books again to see which ones are way past their prime so that I can make room for some new ones. Thanks to everyone who shared. Hopefully everyone is working on or thinking of what they will exhibit at Moontree next year in Plymouth, Indiana. Early next year we will have a schedule of when to drop off your pieces to Anne Binder and a committee will hang them up at the venue. We are very excited about exhibiting as a group and hope you and your lovely artwork will be part of that showcase for May, 2014. I challenge everyone to create a piece to hang or a book to exhibit at Moontree to showcase our talents as calligraphers and/or painters. Lastly, we send our condolences to member Susan Kavanaugh upon the passing of her husband Tom. Our thoughts and prayers are with the Kavanaugh family. 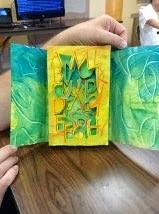 Also to the family of Gwen Weaver, alented calligrapher and teacher. Gwen taught a few classes to our guild several years ago. We will miss Gwen’s amazing lettering styles that we continue to explore. Barbara Mann will be in South Bend to teach a two-day workshop called Paintbox Flowers on October 5 and 6, 2013. 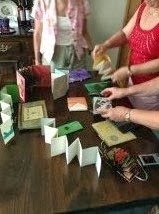 Barbara is a member of our guild living in Michigan and gave a workshop several years ago. We are so glad that she will be joining us again. The workshop cost will be $90 or ($105. for non members) which will include the supplies that Barbara will be bringing. The supply list can be sent via email to those taking the workshop. We have also ordered journals; a brush that Barbara recommended and Arches text wove that will be available at the workshop. We still have a slot or two left if anyone still wants to join us. Please email gvanderhey@hotmail.com asap. The workshop will be limited to 18 people and will again be held at Whispering Pines Apartment Complex in Mishawaka. Pen Dragons Workshops in Kalamazoo – Letters inspired by and based on Adolph Bernd with Peter Thornton, November 2 and 3, 2013. Peter will also be teaching a masterclass on Friday, November 1. Please see: http://www.pendragonscalligraphy.org/PDF%20Files/PETER%27S%20FLYER%20080813%20Lucia-w.pdf for more information. I enjoy sharing new websites that I have come across in our blog. If you come across something that you think would interest the whole group, please email them to Ginny, or Renee, and we will get them on the blog for the next quarter. December 7 – Annual Christmas Get Together at the home of Pat West. We will have a card or ornament exchange again this year. Make one card or one ornament only, for a raffle. Stay tuned for announcements of the 2014 MCG year.